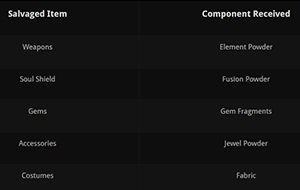 Gems can be traded, but if you socket a tradable gem into your weapon, the gem will no longer be able to be traded. Fortunately, the gems are account bound, which can still be mailed between your own characters. In Blade & Soul weapons, accessories, and Soul Shield provide bonuses or benefits to combat. Higher quality Weapons will contain gem slots, and by inserting a gem of a different color. The color of a gem dictates the types of stats that it can provide, while the quality will dictate the amount of the stat. Players can further customize your combat ability. By upgrading a weapon, or finding new accessories or Soul Shield pieces, you can continually increase your power; in addition, stat bonuses can be added through the use of gems. If a weapon allows for it, additional gem slots can be added through use of a Gem Hammer, and gems can even be removed for a small fee. Crafting requires a lot of material, most of the material comes from Transmutation. Transmutation is a separate process that allows one to use components received by salvaging high quality weapons, accessories, costumes, and gems to improve or create items. There are some special event items that will need to be combined through Transmutation to create event prizes. But some Transmutation recipes do have a chance to fail, and will destroy your crafting components. 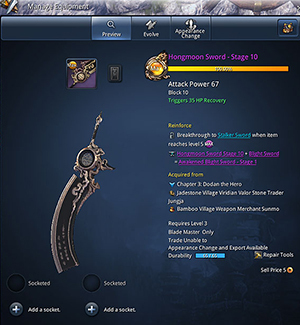 Also, players choose to sell the items in the AH, in order to exchange Blade & Soul Gold. 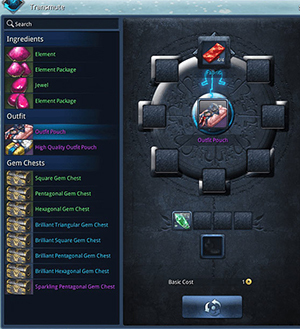 Player can use Transmutation to combine fabric to create outfit pouches that will contain random rewards, gem fragments (and occasionally some other ingredients) will create gem chests that will contain random gems, and multiples of a particular gem can be combined to create a higher quality version. Salvaging and fusing of Soul Shield pieces is a notable process. When salvaging Soul Shields you’ll receive the Fusion Powder component, and through a separate Soul Shield UI you’ll be able to fuse Soul Shield pieces together. By salvaging Soul Shield pieces you don’t want, and using fusing others together, you can further customize and increase your character power. When fusing one Soul Shield piece to another, it will be destroyed, and one of its attributes will be added to the new more power Soul Shield piece.